Whenever I think of a stew, I envision a super relaxing, cozy dinner at home! No matter the season, we all need to wind down after a hard day at work and it’s just so much easier to do so with a hearty, delicious meal rather than a cold salad, don’t you think? I strive to have something cooked for dinner at all times, and although I am not always in a ‘stew’ mood, this one definitely tops the list when I actually crave something like that! 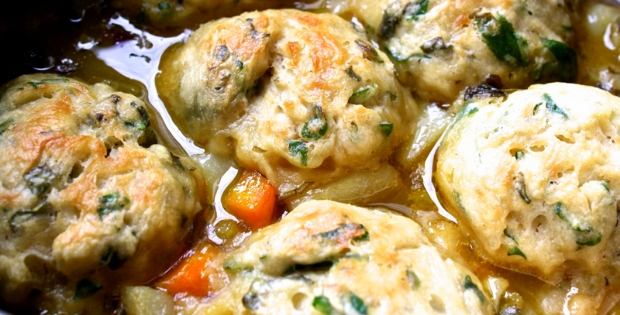 Big hearty dumplings and a stew filled with tons of flavor and all your favorite veggies. Easy to make, too! For 145 more vegan recipes that are not simply delicious, but perfectly balanced nutrition-wise to skyrocket your energy and boost your health, Download The Complete Vegan Recipe Solution. Heat the olive oil in a large heavy-bottomed pan and fry the garlic onions and celery over a medium heat for 4-5 minutes until golden. Add the remaining vegetables and fry for 2 minutes until browned then add the caraway seeds, paprika and tomato puree. Cook for a further 3 minutes. Add the flour and cook stirring for 2-3 minutes. Gradually pour in the wine and stock, stirring. Season and bring to the boil. Lower the heat and simmer for 15-20 minutes until tender. For the dumplings, place the flours in a bowl with a little salt and pepper. Stir in the suet, caraway seeds and horseradish. Add 4 tbsp water or enough to bind the mixture into a smooth, firm dough. Roll the dough into 12 separate 2.5cm (1 inch) balls. Poach the dumplings in a pan of boiling water for 10 minutes until light and fluffy. Place on the casserole to serve and sprinkle with the parsley. You can also steam the dumplings on the top of the casserole for the last 10 minutes of cooking instead of poaching them, if you prefer.